After seeing people rave about their Celltei Pak-o-Bird backpacks on a bird forum, I found myself meandering over to the website, thinking I would just take a gander to see what all of the fuss was about. But my intrigue quickly turned to rapture when I saw that not only did they have a specially designed toucan model, but it was pictured with none other than a Toco inside of it. That was it – the cuteness of imagining the Three-Cans riding in a backpack of their own overcame me – I had to have one! Most people, including David (and honestly, including me), thought it was a pretty far-reaching goal to think I could actually get Paco (or harder still – Paz or Pepe) to ride in it. After all – not only are they toucans who are by nature, boisterous, bouncy, and generally uncontainable, but ours are also adopted adult birds with a history we do not know and this could be one of those things that they are overwhelmingly afraid of such as baskets. But I decided that the rewards of them being trained in the pack were so high, it would be worth it to roll the dice, order the backpack, and put in the effort to see if I was able to muster up the training gusto to get them in it. After a couple of weeks, our Celltei backpack arrived and I was really impressed with the high-quality craftsmanship – from the bright orange, thick nylon exterior, the strength of the zippers and grommets, to the Dragonwood perch – I can tell it is going to last and will withstand some rough-housing from any toucan who decides to challenge it. I also love how it is designed with shades on the sides and front that easily roll-up and latch when they’re not in use. My only wish is that there were some sort of small flap that would allow me access to the inside once the bird is zipped in, such as to reach in and provide a treat, although I’m sure they don’t add this due to safety concerns. I set to work immediately on my training with the backpack. I decided to start with Paco, as he is the most confident of the three and has a higher threshold of tolerance with me when it comes to training which allows me to push him beyond his comfort zone a little harder than I would ever attempt with Paz and Pepe. Plus, since Paco is the one who likes to play outside, I figured I could capitalize on that desire, as he would enjoy the benefits of exploring the outdoors further in the backpack – something which would be scary, rather than exciting, for Paz or Pepe. My main reason for wanting Paco trained to ride in the backpack is that it will allow me to introduce him to more areas, both indoors and out, in a safer, more controlled manner. Currently, he is at ease outdoors in two spaces but when I proceed much further, he gets nervous and less predictable. If he were to fly off in these situations, it could be dangerous and lead to a negative experience. Once he is trained in the backpack, I figure it will allow me to introduce him to a situation where he can still experience the newness, yet feel at ease in his own space. I started by desensitizing Paco to the presence of the backpack, which was rather easy due to his generally fearless personality. After a few minutes of alarmed croaking, his curiosity won out over his fear as always, and he would perch a few feet away, bobbing his head to check out the new addition. I set the backpack on his aviary floor, directly at the base of his perch that allows him access to the ground, thus making it simple for him to hop into the backpack whenever he was ready. Once he was at ease in its presence, I started bringing it in each afternoon when I came to play Bag of Wonder with him. The positive energy of the game helped to reinforce an overall positive association with the backpack – his enthusiasm as I arrived with the game translated directly to the pack. Now, when he sees me walking his way with the backpack, he bounces around excitedly, anticipating fun. Early on, I made the decision to never leave the backpack in his cage unattended, as I would not be able to control his interactions with it. The last thing I would want would be for him to be playing in or around the backpack, have it fall over and scare him, and leave him with a negative impression which would be even more difficult for me to overcome. Paco soon got to a point where the backpack was commonplace and he would allow me to hold him on my arm in front of it, even going as far as leaning his head inside, however, he was resistant to actually hopping onto the perch. We got stuck in this stage of training for about a week, so I decided to give the pack a break before it became just another “toy” he chose to ignore. When I brought it back into Paco’s aviary after a few days cool-off time, his interest in it was renewed. My biggest training breakthrough came when I decided to make going inside of the backpack a game. One day, when we were playing Bag of Wonder, Paco was overly excited about a hard plastic tube and was tossing it around. When he accidentally dropped it and I picked it up, instead of giving it back to him, I decided to take advantage his crazed desire for the toy by tossing it into the backpack instead. And sure enough, he hopped right in, overcoming his fear of standing on the perch by his current need to have the tube. I erupted with enthusiastic congratulations (Paco’s favorite reward) – “YAY PACO YAY!!! GREAT JOB!! You are such a GOOD BOY!! !” followed by adoring kisses to the beak. That sealed it for Paco – for the rest of our time together that day, all he wanted to do was to keep fetching the tube from inside the backpack and be doted upon in my signature gushing fashion. The next step was getting him to the point where he would allow me to zip the door shut with him inside of it. For this, I filled the mini food bowl inside the backpack with one of his favorite treats, Red Apple Paradise pellets. Between those and his current favorite toy sealed inside with him, he was set at ease to sit calmly inside the closed backpack. He only had two short “freak-outs” where he hopped down on the floor of the pack trying to get out through the shut flap. Instead of immediately letting him out, I spoke to him calmly, instructed him to go back to his perch (a command he already knows), and waited for him to settle back down before opening it up to ensure we ended his backpack time on a positive note. The final step was taking Paco outside in it. I have been working on using the cue word “ride” for his time in the backpack, hoping that eventually all I have to say is “Does Paco want to go for a ride?” for him to happily hop right into it. When carrying him around outside, I made sure to keep him elevated at my eye level, as he would be were he on my arm. The joy of the backpack completely set in for Paco when I allowed him out of it for some sunbathing time. Now, he is always willing to “go for a ride”, never knowing what exciting thing it will lead to. As with anything in training toucans, I think the key here was patience and not getting lost in my own excitement by pushing things too far, too quickly. By acknowledging and rewarding all of the baby steps Paco had to take to feel at ease, it ensured the backpack was always seen in a positive light. Also, knowing my bird and that his top priority is always fun and excitement, allowed me to shape our training experience around what really motivates him. I couldn’t be happier with accomplishing this goal, which is all a part of the master plan to allow Paco more freedom and more opportunities to spend quality time with me. 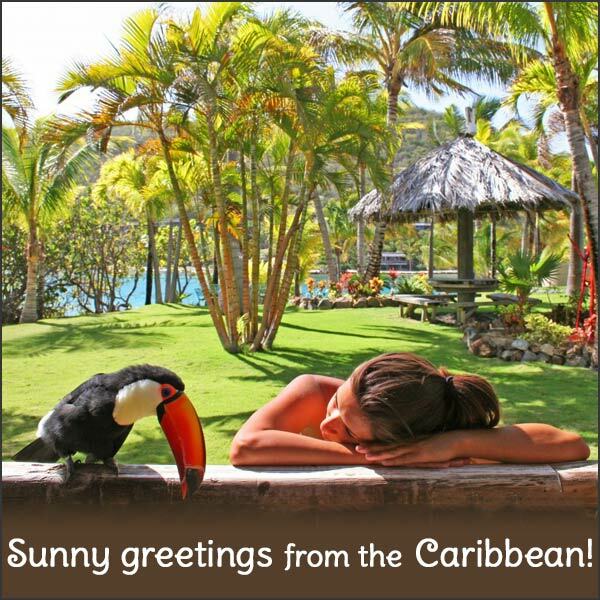 This entry was posted in Training and tagged Adventures in Toucanland, bird, bird training, birds, BVI, Caribbean birds, Celltei, exotic birds, exotic pets, island, Paco, Pak-o-Bird, Paz, Pepe, pet, pet bird, pet birds, pets, positive reinforcement, Saba Rock, Toco, Toco Toucan, Tocos, Toucan, toucan backpack, toucan carrier, toucan training, toucanland, toucans, training, tropical birds by Toucan Lady. Bookmark the permalink. I wonder do these pak o bird’s come with bird pak liners to catch the poop at the bottom? I didn’t see that they sold pak liners, but I have seen a lot of people use newspaper. I have been using a hand towel. The pak can also be hosed out.